Welcome to tutorial 70 in this series of tutorials designed to help you learn to code in TradeStation EasyLanguage. This tutorial, developed using TradeStation 9.0, demonstrates the use of the Global Dictionary. In the tutorial I show how to use the Global Dictionary to synchronize the vertical position of two lines on two charts. Download the programs demonstrated in this tutorial for $29.95. 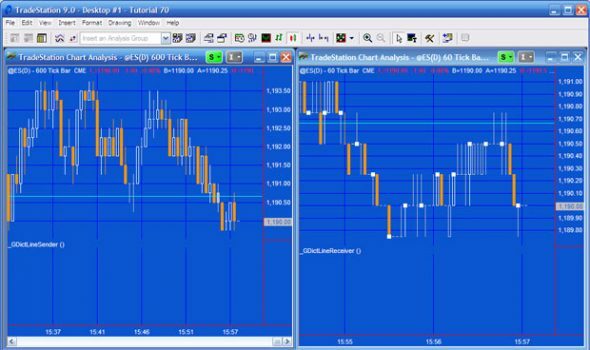 Tutorial 70 programs applied to 600 tick and 60 tick @ES charts. Note that the horizontal line is at the same level on both charts.